In Galatians 5:6 we read that: in Christ Jesus neither circumcision nor un-circumcision avails anything, but faith working through love.. while in Romans 5:16 we read: therefore it is of faith that it might be according to grace. And in 1 Corinthians 13:2 we read that Though I have all faith, so that I could remove mountains, but have not love, I am nothing. There are some qualities in life that we can afford to be without, but without faith we are not even able to begin the Christian life. Without faith we are not in a position to continue the Christian life, and without faith – without trust, it is impossible to please God. Faith the essential key – the key to unlock our hearts to His grace. Faith is necessary for the initial (salvation of the spirit). We are saved by grace.. God’s wonderful grace – but it is through faith. 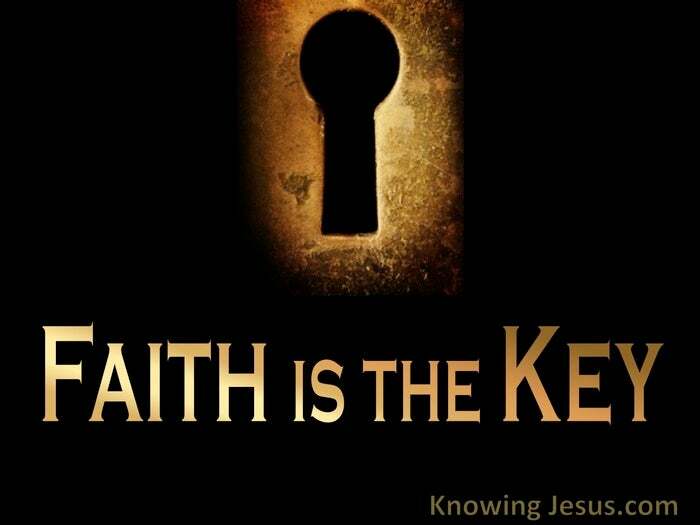 God so loves that whosoever believes shall be saved… Faith is the key to unlock our hearts to His love. Faith is required for holiness and for sanctification (the salvation of the soul). Faith is needed for a life that is being conformed into the image of Jesus, for though it is by the power of the Holy Spirit – it is accessed through faith. Yes, faith is the key to unlock our hearts to growth in grace. Faith is critical in averting our sight away from our current circumstances, and faith is equally critical in recognising our present position “in Christ,” where we are seated together with Him in heavenly places… where life’s earthly conditions have no influence on our heavenly position, in Him. But we must reckon it to be so and we must yield to the Spirit’s leading, and so faith is the key – the key to unlock our hearts to pleasing God. Faith does not shrink back through a furtive imagination or unfounded worry. Trust is not an intellectual exercise or mentally accepting a statement. Belief does not require any visible reassurance or concrete guarantees. Faith is the attitude of the soul that believes God’s Word and acts on it. Trust requires the man – the whole man to accept God’s Word, without reservation. Belief necessitates a decision of the will, to live on the truth of God’s promises. But trust is the key.. faith is the key.. believing is the key to unlock our hearts to His love and His grace. If pardon is offered on the condition of repentance, I need faith to accept it. If forgiveness is dependent on confession, I need to trust 1 John 1:9 for if we (who are saved) confess our sins, He is faithful and just to forgive us our sins and to cleanse us from all unrighteousness. I need to trust that God says what He means and I need to thank Him for His blessed gift and rejoice in His loving forgiveness – or I live my life enchained and entrapped behind the prison door of unbelief. Faith is the key that unlocks the heart to God’s forgiveness. If peace is offered to the mind that is stayed on Him and focused on Him, I must focus my mind on Him and trust in His immutable Word. I must believe what He promises, accept His gift and refuse to be anxious, or I live a defeated life — a life where I see the condition of my problems, instead of my position, as a blood-bought Son of the Highest. But faith is the key that unlocks our hearts to His precious promises. If love is offered – if unconditional love is given, why must I doubt? Jesus tells us that: as the Father has loved Me, so I love you, abide in My love. John 15.9 So faith is the key that unlocks our hearts to His unconditional, agape love. Faith is the soul resting on the Word of God. Faith is the heart acting upon the promises of God. Faith is the secret to a rewarding Christian life.. a life that triumphs. Faith is the prerequisite to pardon; peace; purity and power. Faith is the route, that renounces guilt; worry; impurity and weakness. Faith is the key that unlocks our hearts to His love. How important is faith in accessing all He has promised to us. How essential is trust in receiving all He wants to do in us and through us. How vital is believing what He tells us, for this delights His heart: for without faith it is impossible to please God. Heb.11:6 And yet faith is not the goal. Faith is the way to realise the goal. Trust is not the objective, but the means to achieving the objective. Believing is not the aspiration, but the tool that bring to fruition our aspiration. For when He is revealed, we shall not need faith: when He is revealed, we shall know just as we also are known. When He is revealed, we shall be like Him, for we shall see Him as He is. Faith and belief and trust is not our goal – it is not our objective, our aspiration. Faith and belief and trust is not the utmost need of our hearts, But faith the gracious gift we have all been given to realise our ultimate desire. Faith is the key… Believing is the crucial tool that unbolts our hearts… Trust is the essential element that unlocks our hearts, lives and being.. to His love – to JESUS. If I have all faith so that I can remove all mountains and have not love I am nothing. 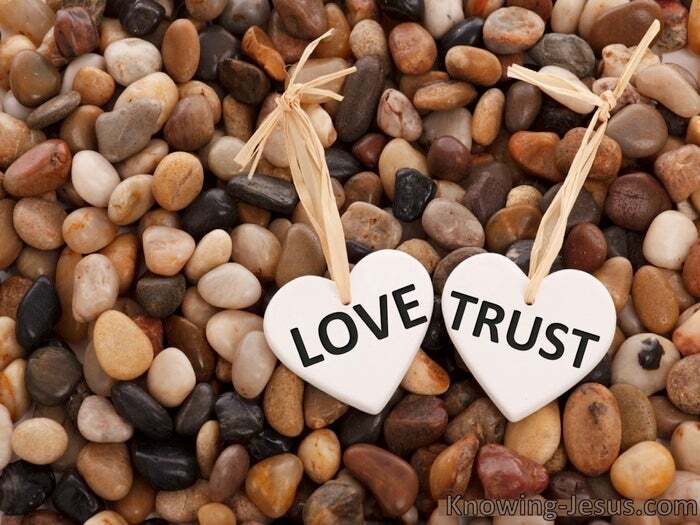 Trust is the essential key to unlock your heart to His love.